Intuitive Eating can be hard to wrap your head around at first. If you are starting the Intuitive Eating journey and are feeling a bit lost you’ve come to the right place. 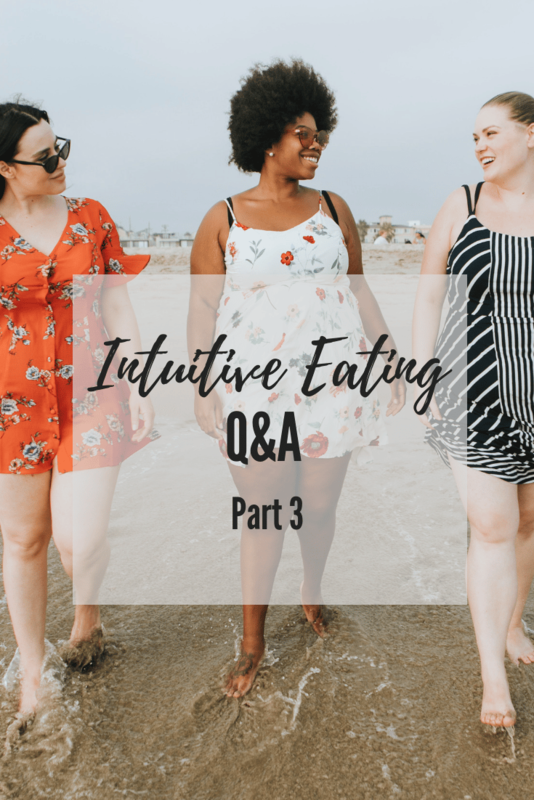 In part 3 of this Q&A series, I’m answering some intuitive eating common questions, such as where does nutrition fit into intuitive eating? Is intuitive eating appropriate for everyone? and “My doctor told me I need to lose weight – is this necessary?” Read on for my answers and tips to help you navigate the Intuitive Eating process. Since starting my Ditch the Diet Facebook group I’ve gotten a lot of questions from people about intuitive eating. If you haven’t yet, make sure to check out Part 1 and Part 2 of this Intuitive Eating Q&A series. How do you go about intuitive eating while advocating for eating healthy foods, without overthinking your food? Like what if your body does not want to eat healthy food, even after intuitively eating for a while? At first, when starting out with Intuitive Eating, nutrition has to be put on the back burner. Because when you’re used to dieting, and not listening to your body, choices made based on “nutrition” still come from a diet mentality or a place of restriction or overthinking. Feeling like you’ll always want less-nutritious foods is a very common concern. It’s important to recognize that it is the dieting mentality that causes overeating and binging or feeling out of control around certain foods. So once you learn to make peace with all foods – and your body knows you can have these foods whenever you want – you’ll be able to truly listen to your body’s physical sensations and feelings of hunger, fullness and satisfaction to decide what foods you want to eat. But you have to go through the period of giving your body whatever it wants so that it begins to know – and trust – that it has access to say, a brownie, whenever it wants one. Only once it really knows and trusts that will you be able to sit back and be able to tell if you really want one. This is also food habituation – when we don’t have things often or don’t allow ourselves things, they become more special. But the more we have them, the less special they become. So for awhile (and I’m not talking a few days, but more like multiple weeks) doing this may mean that you are often eating less nutritious foods, and that’s ok! Once you get through this time period, I find that everyone ends up naturally coming to a place of eating mostly nutritious foods and some fun foods. Once you’re at this place – that is where gentle nutrition comes in. Can you practice Intuitive Eating when you have specific health concerns? I am prediabetic and my doctor has recommended a low carb diet. What is the best way to approach this? First off let me say that intuitive eating is for EVERYONE – so you can certainly still do it with specific health concerns. The problem with diets, even if for specific health issues, is that the restrictions can still trigger overeating or binging. So instead of making things off limits (unless there is truly an immediate life-threatening situation), start by giving yourself permission to eat all foods. Once you do that, eventually you learn to trust your body and overeating or binging slows. You can then make food decisions based on direct experience & for self-care, rather than because it’s off limits. So in the case of diabetes, that could mean craving a donut, eating it, and then noticing – without judgment – how it makes you feel. Do you have an energy crash after? Does the donut taste good or did you not really enjoy it? Couple this with what happens to your blood sugar. Then you start to piece together what foods give you maximum enjoyment AND help you feel good. For example, I had a client with pre-diabetes who was always trying to watch her carb intake & measure portions, but eventually she’d “fall off the wagon”. This cycle continued for years. When we started working together she began working on giving herself permission to eat whatever she wanted – while tuning in her hunger, fullness and satisfaction feelings – and over time found that she a) felt satisfied and full and so was snacking less and not overeating; b) didn’t always love some of the foods she used to overeat so didn’t need to eat them; c) many of her craving/trigger foods went away because knowing she could have them whenever made it so she rarely wanted them. Once you work through making peace with food and tuning into your body signals, then you can start implementing some gentle nutrition to help support your health. I went to the doctor and was told I am “overweight” for my height and should aim to lose a couple pounds to get into a ‘desirable’ BMI, is it really necessary to lose weight to be considered “healthy”? Sadly this happens a lot in the medical community. I want to begin by first commenting on the word “overweight” – I put that in quotes because “overweight” and “obese” are common words used to describe larger bodies, but those are words that have been developed and co-opted by the medical community to medicalize and pathologize (place disease upon) a person’s body. “Overweight” – that is assuming that there is a correct weight that a body should be at – is rooted in the BMI charts which is a problematic measure that assumes health is based on size which is not the case. The BMI was invented over 200 years ago by a Belgian mathematician (not a doctor or even a health professional). He came up with BMI to help the government allocate resources to the population which had nothing to do with how “healthy” someone was. The original inventor even requested that the formula was NOT to be used to measure fatness or someone’s health status! The word “obese” also assigns illness based on size. It’s assuming a body is sick or ill simply based on size, not on any other parameter. This is not only incorrect, but it’s stigmatizing and causes shame. People who are stigmatized based on their size can have profoundly negative mental health effects. In fact, studies have shown that weight stigma has even more of an impact on our health than what we eat! So I avoid using these terms because they have no basis in health and end up just further stigmatizing people (and ourselves). Weight is a highly complex subject. It’s not as easy as adding two and two and getting four. We don’t all start out on an equal playing field because genetics, trauma, abuse, neglect, stress, chronic dieting, and other factors play a big part in determining body size. It’s no surprise that many clients come to me scared and frustrated about their failed attempts at weight loss. So many people try to eat healthfully, exercise and take better care of their bodies and yet still don’t lose weight. However, when it comes to practicing intuitive eating, I cannot predict if you will lose weight – because it’s not up to me or you. Some people will lose weight, some people will gain weight, and some people will stay the same. Stop focusing on weight loss. Read this blog for more info on why weight is not a good indicator of health. Enjoy and focus on what has improved in your life, such as your relationship with food and your body, self-esteem, and health. This post has suggestions on how to measure progress without focusing on numbers or weight. Work on accepting and respecting your body as is. I highly recommend the book Body Kindness as a place to start. Remember that you’re not a bad person for wanting to lose weight – we live in a crazy, diet culture and weight-obsessed society. However, also remember that this culture’s range of what’s considered “normal weight” is very narrow and impossible for most people to achieve. You may not be able to achieve the weight loss you desire, but you can certainly choose to enjoy your best life and treat your body with care and respect, no matter what your size or weight. 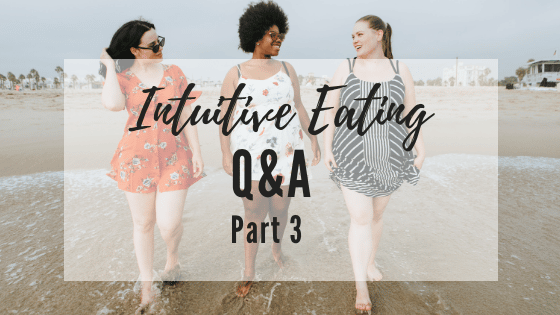 Do you have other questions about intuitive eating? Share in the comments below and I’ll answer them in a future post! I am underweight and struggle with a restrictive eating disorder. I really like the concept of intuitive eating because I would like to move towards more freedom around eating and a more positive relationship with food. However, when I come across information about intuitive eating it is almost always aimed at people trying to loose weight. So i am insecure about trying to eat intuitively because I don’t have any natural hunger or fullness cues. I find it hard to distinguish between healthy intuition and eating disorder related thoughts. Will my hunger or fullness cues naturally return after a while? Can I trust my body that it will ask for what it needs? Do you have any recommendations how to go about it? Is it safe for me or should I wait until I get to a “healthy” weight before I try it out? Hi Lea, thanks for your question! If you don’t have natural hunger/fullness cues yet then it’s important to start by having structured meal and snack times 4-5 times per day, until those signals return (having structured eating times will help them come back). I highly recommend that you work with a dietitian and therapist trained in eating disorders. One other note – intuitive eating is not a weight loss method, if you ever see it being promoted as such, know that those people are not using intuitive eating as it was meant to be used!